There is one hidden resort in Japan that, despite being home to one of the most famous hot spring regions in the country and to skiing fields whose history spans over a hundred years, still awaits discovery by the western world. That resort is the Kusatsu Onsen of Gunma Prefecture next door to Nagano Prefecture. To understand what makes Kusatsu Onsen so special, you need look no further than its hot spring fields. These fields are facilities where the water of the hot springs is drawn out to flow freely across the ground and on wooden flumes to collect hot spring mineral flowers (the mineral component of hot spring waters that are stored in a dried, powdered state that resemble a flower, turning hot water into hot spring water when mixed) and adjust the temperature of the waters. Although similar fields can be found across Japan, those in Kusatsu are so large in size and so great in renown, the term ‘hot spring field’ is almost synonymous with the area. Kusatsu Onsen is one of, if not the most famous hot springs in the country, frequently coming out on top in hot spring rankings in Japan. Its history reaches back to the age of legend itself, although its first appearance in written record is in the year 1472. Even then, the hot springs here were well known throughout Japan for the quality of their water, securing the region its place as a popular hot spring health resort. The quality of the hot spring water is of particular note. The mineral components of the water grant it a strong aroma of sulfur and are quite potent in nature, being effective in treating ailments such as skin conditions and nerve pain. The town of Kusatsu itself spreads out in a large circle around the giant hot spring fields, which are lined with numerous restaurants, tourist shops, and more. And while it is common for guests to dine at the facilities their accommodation provides, many prefer to walk about the town in search of a restaurant that suits their mood. In Kusatsu, you are spoiled for choice. At night, looking out over the hot spring fields as they are lit up in the evening light while dipping your feet into the foot spas before heading off to a restaurant for dinner is also a treat. Another great attraction can be found in the hot spring water handling shows. Hot spring water handling is the tradition of mixing together water with a wooden ladle while slowly bringing down its temperature and softening it, a traditional technique used since the Edo period. Kusatsu offers just such a glimpse of some of Japan’s ancient and fascinating traditions. Another of Kusatsu’s attractions are the ski fields. Although a multitude of tourists from Australia and elsewhere across the globe have come to visit the ski fields of Japan in recent years, this is one that has escaped the spotlight of Australians and other skiers from abroad. The reason is much like that of the hot springs themselves – their popularity within Japan has been enough to sustain them. The Snow & Spa Resort Kusatsu is one of Japan’s most historic ski fields, and the first in the country to have ski lifts installed. At an average elevation of 926 metres, the mountain’s peak sits at 2171 metres above sea level. The Japan’s quality of its snow is among the best in Japan, and its ski slopes range up to a length of 8 kilometres. The ski fields are starting to see a gradual increase in tourists from outside Japan who have come to realise the region’s attraction, and with the range of attractions for your post-skiing stay, this is one area whose potential is undeniable. While the ski fields and hot springs are both some of Kusatsu’s greatest attractions, one of the largest barriers to tourists from abroad is access. Most travellers come to the area from Tokyo, having to move from the trains to the bus, or making a reservation for the direct bus service. Even then, however, making it from the bus terminal to your final destination is no easy task. 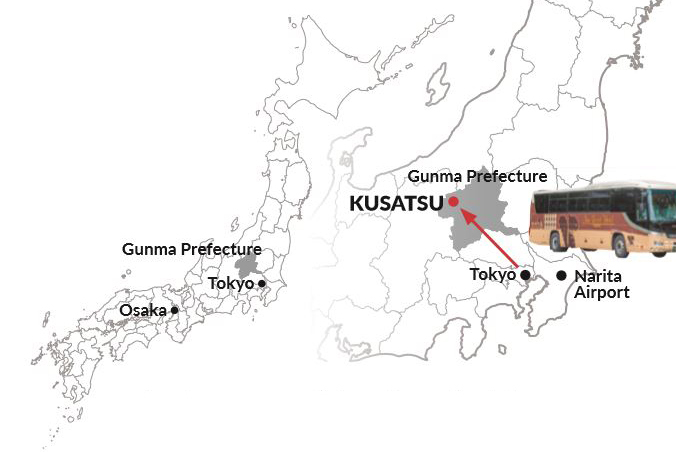 Kusatsu Now Resort Hotel provides the answer with a direct bus service leaving daily from Shinjuku in Tokyo. (See the hotel’s homepage for conditions, such as the requirement for bus travellers to stay in twin rooms.) 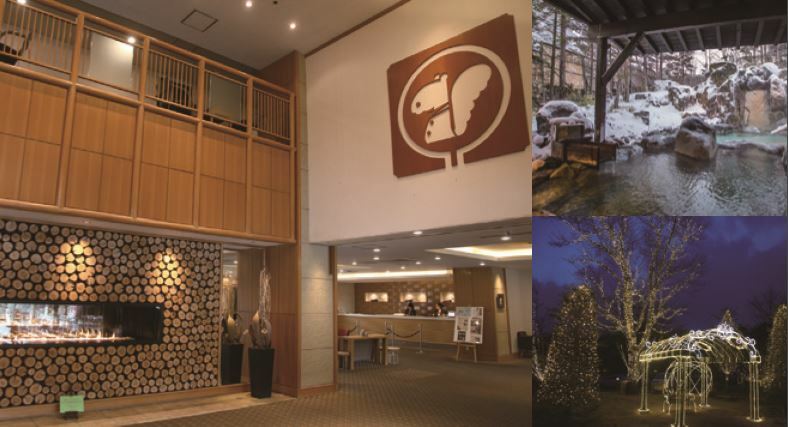 The Kusatsu Now Resort Hotel welcomes travellers from abroad, and is known for its high level of service for overseas visitors. Its handy location a mere walk away from the ski fields and hot spring town alike make it a handy spot, and the ability to take shuttle buses every day from morning until night also make for an attractive addition. The hotel itself is host to a store with premium ski equipment for hire, and to four high-quality restaurants serving Japanese and western-style buffets, French, Japanese, and Chinese cuisine, and the accommodation plans with meals included are a hit. Those who prefer to dine in the hot spring town itself have the choice of a breakfast-only plan. In the hotel is a joint bathing area known as the ‘big bath’ where you can enjoy outdoor and indoor bathing areas supplied by the hot spring waters of Kusatsu to your heart’s content. If a joint bathing area is not quite your taste, however, there are also private outdoor bathing areas with a multitude of styles including traditional Japanese cypress and Shigaraki ceramic baths. The combination of private bathing areas and Japanese-style rooms let you relax in your room after a long dip in the hot waters. The hotel is also offers pools, table tennis tables, tennis courts, putter golf spaces and other recreational facilities such as karaoke, bars, and other activities, and massage and other relaxation facilities. With so much on offer, why not choose Kusatsu Now Resort Hotel for your first adventure in Kusatsu?